Feel like you're really airborne without ever leaving your armchair. Just moments ago, I was flying like a hawk. It wasn't a dream, or even virtual reality. It was a real, immersive experience fully under my control. Moments later, I'm very much on the ground, poking at some dense, tangled shrubbery with a stick. I had been operating a tiny camera-equipped mini-quadcopter, via video goggles that beam the drone's eye-view right into your peepers. It's known as "first-person view" (FPV) flying, and it's an incredibly fun out-of-body experience. Imagine being shrunk to the size of an ant and sitting in a virtual cockpit and you'll have an idea of where I'm going here. Why the stick, though? Today I went too high, got caught by a gust of wind and landed on a canopy of vegetation. I'm prodding at the knotted vines in the vain hope I might dislodge it. I've become so fond of my zen-time in the goggles that my stomach sinks at the thought of all that coming to an end. I'm not leaving until I find this thing. FPV flying isn't new, but historically it's either been complicated or expensive, not to mention it requires both space and skill. At $150, the Blade Nano QX2 drone I was flying is relatively affordable, suitable for new or experienced pilots and can be flown indoors -- though you'll need to pay about the same for optional goggles. The benefit of flying inside is a practical one: You don't have to waste time finding somewhere you can legally operate the device. You can practice as much as you want in the comfort of your own home. There's usually no tangled shrubbery either. I've experimented with FPV flying before, but with bigger drones like the DJI Phantom. These require you to keep an eye on them, so I only ever managed a quick second in the goggles to check my shot, or else I wore them while someone else controlled the device. This passive viewing is enjoyable, but nowhere near as fun as when you're at the helm. The QX2 is lightweight but robust enough to take a few knocks (of which there will be many). Importantly, it's small enough that it can't do much harm, though it will nip you if the motors catch you. My first few FPV flights with the QX2 and optional goggles were mostly spent doing the "walk of shame" -- i.e., retrieving it after a crash. 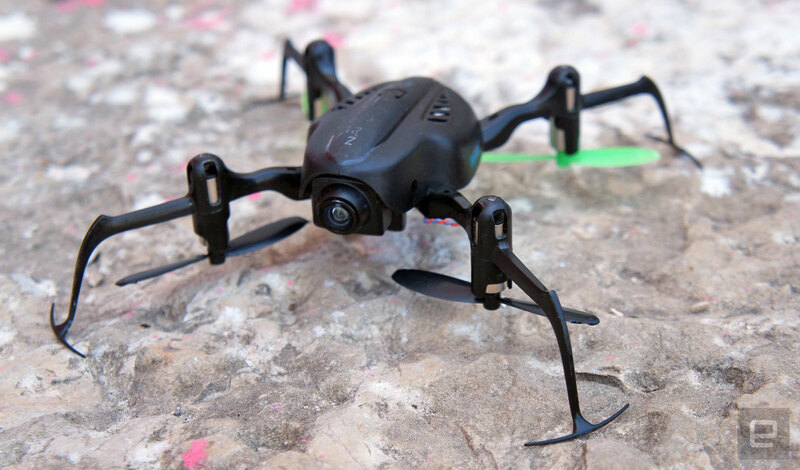 It's easy to bang into walls at first as the tiny drone is surprisingly responsive. Bigger, outdoor craft like DJI's Phantom series, or Yuneec's Typhoon are much more stable; with the QX2 you're constantly making minor adjustments. It's not difficult to pick it up, though, and before long I was taking corners at speed and zipping around my apartment, much to the annoyance of my cat. What makes the QX2 interesting is that it transmits video right out of the box. There are myriad cheap, tiny quadcopters with cameras on them, but not so many at this price that have the wireless video link built in. 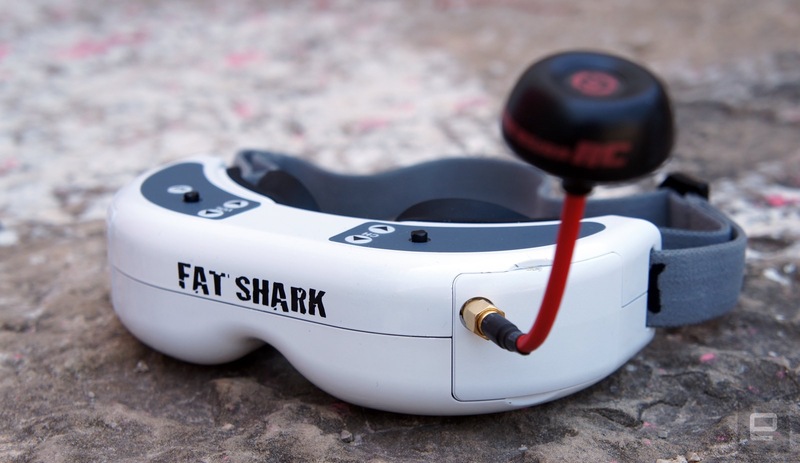 The QX2 transmits at 5.8GHz on what are often known as "Fat Shark frequencies" -- a reference to their compatibility with the popular brand of video goggles. Typically there are eight channels (sometimes more), so you and seven friends can fly together without interfering with each other. Anyone in range with compatible goggles can "tune in" to your camera. This is what lets the audience have a "front row seat" at drone racing events. The YouTube videos from these "nano" quadcopters are mostly tours around their owner's condos. Like a weird version of "Cribs" for middle-aged goggle-wearing hobby enthusiasts. The grainy clips are equal parts product review and voyeuristic snooping around someone's house. The QX2's onboard camera isn't high-quality; it's just for FPV, not recording video (though you can do that with some models of Fat Shark). It took a few weeks before I was good enough at flying that I could sit in my front room darting around the house until the battery gave out (it lasts about six minutes). It was during one of these flights that my conscious control of the QX2 gave way to something else: I really felt like I was flying. While I was learning, I would stay low, or at waist height. With more confidence, I started going higher and faster. Flying high meddles with my internal sense of balance, and feels like floating. It was this feeling that I started to crave. The difference between being the pilot rather than passive viewer is the direct connection between visual input and your manual control of the quadcopter. If you're about to bang into a wall, but micro-adjust to avoid it, it feels real and comes with a spike of adrenaline. Just watching a video of the same maneuver doesn't engage the brain in the same way. While passively viewing I can remain still. When I'm darting around objects, my head moves left and right. I feel the proximity as I narrowly miss a tree. An unexpected side effect of flying FPV is that I start to dream about flying. This is one of the more common themes I have in my unconscious state, even if I can remember only a few flying dreams a year. Pro drone racer Chris Haskins tells me that it's not just newcomers, either. Flying with the goggles still feels like an out-of-body experience to him -- and that it often permeates his dreams. And, just like regular dreams, they can contain a message. "I often dream about a troublesome part of the track and how to clean up my flying." The good thing about the QX2 is that while it's ideal for beginners, it's fast and acrobatic enough to teach you lots about flying techniques. The fact that the FPV is ready to go without needing any modifications is a real bonus as well. You will, however, need to buy an RC transmitter (controller), but any standard one will do, in case you have one already. If you have maker chops, then you could instead build your own FPV drone for less money, but for the rest of us, the QX2 is a great place to start. As for goggles, there are many options, but Fat Shark's Teleporter model (around $160 with 320 x 240 resolution) is a good entry point, though you'll soon want to upgrade to those with a bigger resolution. I promise. As with all vices, you'll quickly feel a desire to increase the dosage. I upgraded to Fat Shark's Dominator HD goggles, which have a bigger (800 x 600) display, and it's a much more immersive experience. (And at over $500, it's more expensive too.) I've also been keen to try out the Avegant Glyph, which offers a much clearer, 720p image. The Glyph doesn't receive the wireless signal, though; instead, it requires an HDMI input. That said, many consumer drones now come with HDMI ports on the controller/transmitter that will feed video right into the Glyph. For now, though, the QX2 and Fat Shark combo is a solid, affordable introduction into FPV. Which is just as well, as it looks like I'm going to have to buy another one.